You are currently browsing the tag archive for the ‘hanging plants’ tag. I was sent a link to a truly wonderful website earlier this week. The website is about greening the footpaths & public spaces in San Francisco which the group Plant*SF call ‘Paving to Planting.’ Volunteers plant the newly created pavement gardens in San Francisco & make barren concrete, hot, ugly areas look wonderful. Apart from the hard work of removing the concrete & the physical effort of planting, the process of greening an area is really quite simple. It just needs people, some funds, suitable locations, cooperation, organization & plants, lots of plants or Council could just do it as part of their usual management of the LGA. 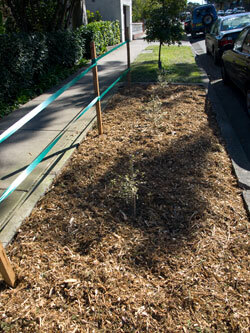 The ‘Paving to Planting’ projects done by Plant*SF take what Marrickville Council are doing a step further & is what I think Marrickville Council should be aiming for. The volunteers of Plant*SF not only remove concrete for a garden bed on the verge, they also remove extraneous concrete beside buildings where they plant vines & espalier trees along walls of buildings so the green walls stop reflecting heat. They leave a good size footpath & plant along both sides. This is what I remember from my childhood before the reign of concrete became the norm. They also add planter-boxes & the odd seat encouraging people to use the footpath as a space to congregate & communicate with their neighbours. Mind you, their planter boxes show there is quite a difference in effect just with the choice of planter box design. The Heat Island Effect is something we ignore at our peril. Most of the remedies are so easy, though they do require a change in the way we think things should look like. Making changes to our footpaths & cemented or paved areas is relatively cheap to do & have the potential to be quite pretty as well. This can only be good for the community because it is known that green plants, flowers & trees make people feel good. It’s been proven that a view of trees relieves anxiety & depression, helps kids with hyperactivity, helps girls study, helps people heal quicker & reduces hospital stay for a start. 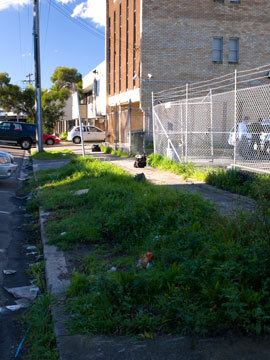 Concrete only where it has utility, garden beds & plants will make Marrickville LGA a far nicer place to live. If Marrickville Council do decide to do this, I would hope they start on the areas that have fewer trees & more concrete as I keep discovering areas in the LGA that are really in need of serious greening. An example of the wrong type of green in Gerald Street Marrickville. This street is in serious need of help. Our shopping strips, now under threat because of the Marrickville Metro expansion, could also be helped with beautification to encourage more people to shop there. Paving along shopping strips is nice, but better would be regular spaced planter boxes brimming with plants, hanging pots from awnings, street corners or from poles like City of Sydney Council have done along Glebe Point Road. This would also make the shopping strips much nicer & would have to be cheaper than the $60,000 needed to replace the tiled footpath along a short space of shops. The hanging pots & planter boxes in Glebe are still going strong more than 18 months after they were installed proving that stepping out of the box can have longevity making the initial outlay of money worthwhile.